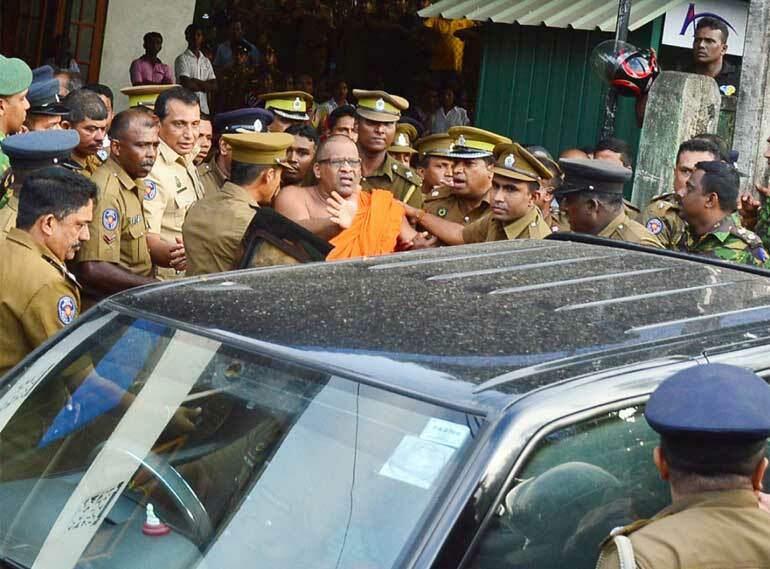 After a year in the shadows, Galagoda Aththe Gnanasara, the controversial monk who leads the radical Buddhist group Bodu Bala Sena, is front and centre of the news cycle again. He is storming into courtrooms, insulting Government lawyers and threatening, allegedly in foul language, the woman who has been searching for her missing husband for the better part of six years. Sandhya Eknaligoda, the wife of disappeared journalist Prageeth Eknaligoda, has pursued a lengthy legal process to find the whereabouts of her husband or learn the facts pertaining to his disappearance. Her Habeas Corpus petition is being investigated by the Homagama Magistrate’s Court. Since the defeat of the Rajapaksa administration one year ago, the Eknaligoda investigation has gathered steam, with police sleuths linking his disappearance to an army camp in Giritale, in the Polonnaruwa District. As evidence continues to surface that links the military to Prageeth Eknaligoda’s disappearance, the army begans to close ranks. Frustrated by the lack of cooperation from the military, CID sleuths complained to the Homagama Magistrate, who threatened to issue notice on the Army Chief Chrishantha De Silva unless his forces cooperated with the investigation into Prageeth’s disappearance. In a country where the conviction of a soldier who was found guilty of the murder of eight persons including two children as in Mirusuvil Jaffna 16 years ago, is perceived as being high treason and a betrayal of the heroes of war, the implication of the military in the high profile disappearance of a dissenting journalist is causing ripples in the ultra-nationalist fringe. These fringe groups paint Prageeth as a double-dealing LTTE spy, thereby justifying his alleged detention by the military that is currently under investigation. Sandhya Eknaligoda, for her crime of persistently believing in her husband’s innocence, convinced his disappearance must be accounted for and justice granted to her family, has found herself in their crosshairs. Galagoda Aththe Gnanasara, the vociferous leader of the BBS, accused of instigating vicious religious riots in Aluthgama in June 2014, is leading the charge. On Monday he stormed into the Homagama Magistrate’s Court and tried to intervene in the Eknaligoda case. He wanted to state his case, the BBS General Secretary said. The Magistrate, taken aback by the outburst, declined the request, since he said the monk was not a party to the disappearance case. Gnanasara Thero then resorted to bad old habits. Fancying himself a renegade crusader for the Sri Lankan armed forces, the monk lashed out at Government lawyers, court officials and police officials investigating the Eknaligoda case. He called them napunsakayas (eunuchs). He called them traitors. He reminded them that Sri Lanka had been at war. He said the missing journalist was a LTTE spy. Then, the venerable monk leaned in close to Sandhya Eknaligoda’s ear to whisper foul-mouthed threats, before flinging his robes about and storming out of the court room. Sometime between this tirade, the Homagama Magistrate warned the monk that the only reason he was not being thrown in jail immediately was because he wore saffron robes. In a society that venerates the Buddhist clergy, the saffron robe is a cloak of impunity, and in recent times, with the ascent of groups like the Bodu Bala Sena, it has managed to transform common thugs and criminals into religious renegades that the law cannot touch. In 2013 and 2014, during what may be called in retrospect, the declining years of the Rajapaksa regime, the Bodu Bala Sena reigned supreme. The group raided slaughter houses and Muslim businesses, stormed ministerial offices, assaulted moderate monks and dismantled and “reclaimed” Islamic, Christian and Hindu shrines. In these crimes, they enjoyed absolute impunity. The former Defence Secretary and presidential sibling publicly attended the group’s events and privately, as it was revealed after the fall of the Rajapksa administration, provided the hardline group with resources from the Ministry of Defence and regularly hosted alms-givings for the controversial monks. Naturally, police personnel were terrified of getting in their way. The BBS, and their lesser cousins like the Ravana Balaya, were foot-soldiers of the Empire, a construct of the Rajapaksa project to create a “Sinhala only” Sri Lanka. The BBS, the Rajapaksas believed were a useful, if unruly tool to keep the Sinhala majority feeling outraged and mistrustful of other ethnic groups, and crucially reliant on the Rajapaksa administration to defend the Sinhala-Buddhist nation and keep it safe. It was an election strategy that went badly wrong for the Rajapaksa regime in the end game, when the minority communities including the formerly loyal Muslims deserted the incumbent President en masse in the January 2015 election. But a hostage of its own ultra-nationalist ideology, the regime did not possess the foresight to see this. Since the fall of the previous regime, the Bodu Bala Sena and its counterparts went quiet. Legal action against the BBS and its notorious figurehead monk was continuing at a quiet pace. Wrapped up as they were in the Rajapaksa administration’s agendas, it was easy to believe that the fall of the Empire had left its storm-troopers rudderless; without state patronage and protection, they faded into the fringes of political discourse, exactly where they should have been all along. It’s not clear what brought Gnanasara Thero and his ilk out of the shadows again, only one year since the Sirisena administration took over. The timing however, is significant. On Saturday, the ‘Sinhala protectionist’ group ‘Sinha Le’ elevated itself from being an alarmingly widespread sticker campaign to a real radical nationalist group, led by monks and showing familiar tendencies to be unruly. On Saturday, they held a motor rally from Colombo to Kandy, where they converged upon the Temple of the Tooth waving lion flags conspicuously missing the orange and green stripes that recognise minority ethnic groups living in the island. The distortion of the national flag is an offence under the constitution. Exercising their authority, police personnel at the Sinha Le rally on Saturday requested the demonstrators to stop using the distorted flag. In response, the police officials were on the receiving end of a barrage of verbal abuse and confronted with a mob that grew even more unruly. The Sinha Le campaign arrived seemingly out of nowhere. Before the situation began to escalate on Saturday, it was easy to dismiss the insidious racism manifesting itself on vehicles around Colombo and other major cities as ‘just a sticker campaign’. It did not seem to warrant serious attention, not even when five Muslim youth were assaulted by a group arriving in a Sinha Le three-wheeler, or when unknown persons graffittied the word Sinha Le on the gates and parapet walls of several Muslim homes in Nugegoda earlier this month. Arguments were being made about “Sinha-Le” being only an ancient name for Sri Lanka, the land of the Hela people. Increasingly, it appears the Sinha Le campaign is an attempt to give voice and expression to ultra-nationalist force relegated to the fringes since the fall of the Rajapaksa regime in January last year. Speculation is also rife in some political circles, that the campaign is being well-funded by political elements aligned to the top-rung of the former regime. Perhaps Galagoda Aththe Gnanasara felt Sinha Le was about to steal his thunder. Perhaps he was spurred into action by the meteoric rise of another ultra-nationalist outfit that looked set to outdo the Bodu Bala Sena at its anti-minority game. Or perhaps, his new found confidence to stride into a courtroom in session and spew abuse was inspired by a certain meeting with President Maithripala Sirisena earlier this month. The President’s Office claimed that the meeting had been granted to Gnanasara Thero and his “delegation” on the basis of a written request for a discussion from the Bodu Bala Sena in December. The Sirisena administration said no more about the meeting. But the Bodu Bala Sena General Secretary practically crowed. “The President was very receptive to our concerns,” he told the media brimming with confidence soon after the meeting. “He called the Army Commander immediately in our presence and asked him to stop the relocation of Sinhalese families who had settled in Bogaswewa, a Sinhalese village created by the army in Vavuniya,” he claimed. In his post-meeting interview on 19 January, the monk said he had informed President about the ‘good work’ the Bodu Bala Sena had started during the tenure of the Rajapaksa regime. President Sirisena has spent his first year in office, repeatedly calling for unity between different ethnic and religious communities living in the island. Hailing from the Sinhala heartland, born to a simple farming family, President Sirisena is no cosmopolitan liberal. He does not necessarily speak the language of conflict resolution and transitional justice. But he has espoused a simple worldview that resonates with a majority of Sri Lankans, who desperately desire peace and economic prosperity after a long and brutal civil war. President Sirisena has talked about trust-building, bridge-building, winning hearts and minds and transcending ethnic and religious barriers to live again as one people. For Maithripala Sirisena, his constituency comprises all those who stood against the ideology of the Bodu Bala Sena, the Ravana Balaya and now the Sinha Le campaign. They were Sinhalese and Muslim and Tamil. They were moderates and true adherents of the Buddha’s doctrine. A major factor in his election and the corresponding defeat of a regime that was both autocratic and divisive, was the latter’s embrace of radical Sinhala Buddhist groups and the terror they had been permitted to inspire in the hearts of minority communities. Under these circumstances, the reasons for President Sirisena to grant the likes of Gnanasara Thero a meeting at the Presidential Secretariat seem unfathomable. Analysts argue that it is part of the President’s ongoing efforts to curb the threat of a Rajapaksa renaissance and keep his own Sinhala Buddhist credentials in play. But his decision to grant the meeting is in effect to act against his own constituency and do grievous damage to his own carefully constructed image of national unifier. In granting the audience, President Sirisena in effect returned legitimacy to the Bodu Bala Sena, the group accused of instigating the Aluthgama riots that killed three people and destroyed Muslim owned homes, businesses and livelihoods in the besieged town. Clearly the convergence of these two events: the rise of Sinha Le and the benediction of sorts he believes he received from the current Head of State, have had a remarkable effect on Gnanasara Thero and the organisation he leads. It has given him cause to believe that he is once more ‘protected’ and emboldened the monk to come out of the shadows and recommence his campaign of terror and intimidation. Suddenly, it’s 2014 again. Except everything is not quite the same. On Tuesday, the Homagama Magistrate ordered the arrest of the marauding monk and remanded him until 9th February at the Welikada prison. Going one step further, the Magistrate yesterday also ordered police to arrest members of the mob that laid siege on his courthouse on Tuesday in support of the Bodu Bala Sena monk. Media footage of the pandemonium the protestors caused outside the court premises will assist the police to identify perpetrators of the assault on the premises and prison officials. Seemingly hale and hearty when he was storming the courtroom and giving rousing speeches on his way to Welikada, prison doctors have now advised that the monk be transferred to the prison hospital, a place all criminal politicians and their cohorts tend to inhabit while in remand custody. Nonetheless, the prospect of the Bodu Bala Sena General Secretary being thrown in jail for unruly behavior was unthinkable only a year ago. In Parliament, after BBS mobs stormed the Homagama court premises and prevented the movement of a prison bus carrying the controversial monk to Welikada, Prime Minister Ranil Wickremesinghe condemned the conduct of Buddhist priests leading the crowds. “As Buddhists, we are ashamed of this behavior,” the Premier told the House. In the manner of a class teacher complaining to the principal about badly behaved students, Wickremesinghe also said he ordered the police to send a full report of the incident at the Homagama courts to the Mahanayake Theros. No greater case has been made for the enactment of the Bhikkhu Kathikawath bill than the scenes that unfolded in front of the Homagama Magistrate’s Court on Tuesday. The controversial draft legislation was introduced at the behest of the Chief Prelates of the Asigiri and Malwatte chapters and seeks to give legal effect to codes of conduct for members of the Sangha from Buddhist monastic orders operating in the country. The monks who oppose the bill argue that the rulers have no place in overseeing the conduct of the Buddhist clergy. But detractors of the bill appear to have forgotten that the third Sangha Council convened by Emperor Ashoka, revered as the greatest Buddhist monarch and missionary the world has ever known, was specifically aimed at weeding out 60,000 chora sangha or rogue monks, who had worn the robes purely for the benefits the clergy received from the rulers. Ashoka, arguably the greatest Buddhist king of all time, sent out missions to nine countries including Sri Lanka, ensuring that the doctrine stayed alive in other parts of Asia even after it died out in Northern India. According to the Mahavamsa, Chapter V, entitled The Third Council, it was the King himself who questioned each monk on the teachings of the Buddha, expelling them from monkhood when they expounded the wrong doctrine. In many ways, the relationship between rulers and the sangha in nations modeling themselves on Buddhism appear symbiotic; they each possess a moral obligation to bring the other into the light. Sobitha Thero played this role when darkness was engulfing the political sphere; perhaps it is also the duty of the ruler to empower chief monks to discipline errant bhikkhus when they deviate from the teachings of the Doctrine. 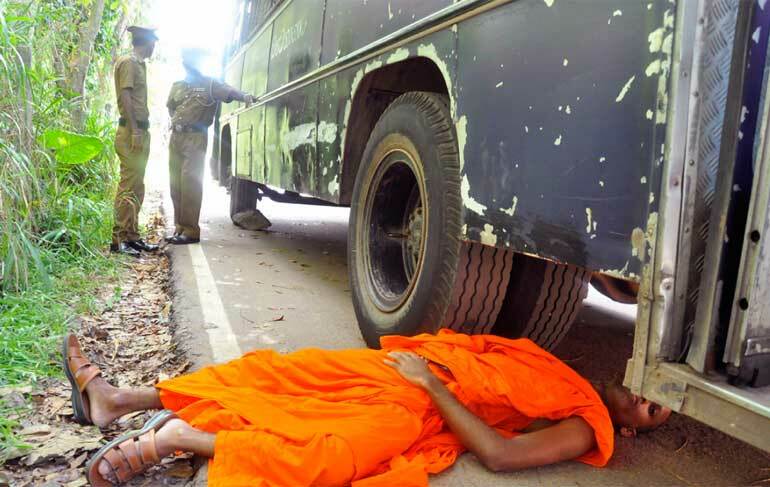 The request from the Mahanayakes for the legislation, arises partly from the frustration and helplessness moderate monks were feeling during the Bodu Bala Sena’s reign of terror. Many of them did not condone the conduct of the monks, but they were largely powerless in the face of the distortion and misinterpretation of the doctrine. The vinaya or disciplinary code governing the conduct of the sangha is not legally binding, and even expulsion from a monastic order has no bearing on the ability of a monk to continue to wear saffron robes and pose as a bhikkhu. The bill seeks to change this situation and give the regulations legal effect. The swift condemnation of the courtroom attack and the Government’s decision to permit Gnanasara Thero’s arrest for contempt of court sets it apart from the previous regime. The present Government, mired in an endless loop of its own problems, ranging from the economy to keeping tensions from boiling over in a tenuous coalition of the two main parties, is neither racist nor inclined to condone racism. What it may be tempted to do however, as has already been made evident by the President’s decision to grant the Bodu Bala Sena an audience, is to treat these radical groups with kid-gloves and pander to their interests in order to retain or increase support among the Sinhala majority community. The real test of this Government’s distinction from the last will be in its capacity and political will to denounce the ideology of the BBS and like-minded groups, and everything they stand for, to allow the law to act swiftly and without prejudice against perpetrators of violence and communal hatred, and convince the vast majority of moderates that backed its ascent to power last year, that it wants no part and no complicity in the ethno-religious fascism these groups espouse. The last time a UNP led Government was defeated, their ousters rode to victory on a wave of nationalism and whipped up hysteria about Ranil Wickremesinghe’s peace process and ceasefire agreement with the LTTE. As disillusionment sets in about the UNFGG Government and its stagnation on multiple fronts, the pro-Rajapaksa forces need the ultra nationalist forces more than ever. If that faction has any hope of denting the UNP fortunes in the forthcoming local government elections, they must necessarily ride a wave of Sinhala nationalism and spread fear about a betrayal of national security and the Sinhala race to get any traction. It is therefore not just a moral obligation on the part of the Government to investigate and stem the sudden resurgence of ethno-religious radicalism that is threatening to shatter a tenuous reconciliation process and polarise communities. Keeping the wolves at bay and relegated to the shadows could also prove critical to its own political survival.